Living a Fit and Full Life: Use Waterpik® Complete Care 5.0 for Optimal Oral Health! Use Waterpik® Complete Care 5.0 for Optimal Oral Health! Water Pik, Inc. has been a leader in developing personal and oral health care products for the entire family since 1962. We have acquired many patents for our innovations, and Waterpik® products are recognized for award-winning design and technology. 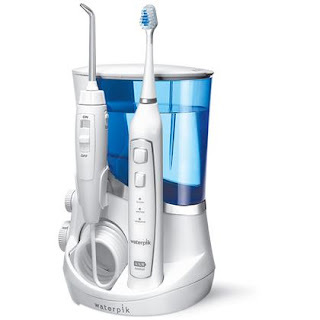 Waterpik® Complete Care 5.0 is the perfect way to improve your oral health! I've been using Waterpik® Complete Care 5.0 for about 3 weeks now and I have already noticed that my gums feel and even look healthier. I have a few crowns and feel that the best way to clean around the gum line is with Waterpik Complete Care 5.0's Water Flosser. Not only does it remove plaque but I've also noticed that it has reduced the sensitivity of my gums especially those sensitive areas around my crowns. I also love how easily it dislodges food from my teeth. While I don't have braces I will tell you that this Waterpik® Complete Care 5.0 system would be fabulous at keeping both teeth and braces clean. Waterpik's Triple Sonic Toothbrush is also incredible! I love that it's timed for 2 minutes and gives you a 30 second quadrant pacer so you can evenly brush your teeth. The 3 sonic modes are perfect so you can select which mode works best for you. I also really like that Waterpik's Triple Sonic Toothbrush also has a tongue scraper since it's also important to keep your tongue clean. I have to mention that I just had a dental checkup and my dentist was very impressed. Waterpik® Complete Care 5.0 is amazing and I highly recommend it! Click HERE to find a store near you that sells Water Pik! Click HERE to learn more about Water Pik! Follow Water Pik on social media!